Almost exactly one year after my post concluding “2.00EV”, which laid out the foundations of what would become “2.00gokart”, I’m glad to say the semester is over and done with, and that it basically went down exactly like that. 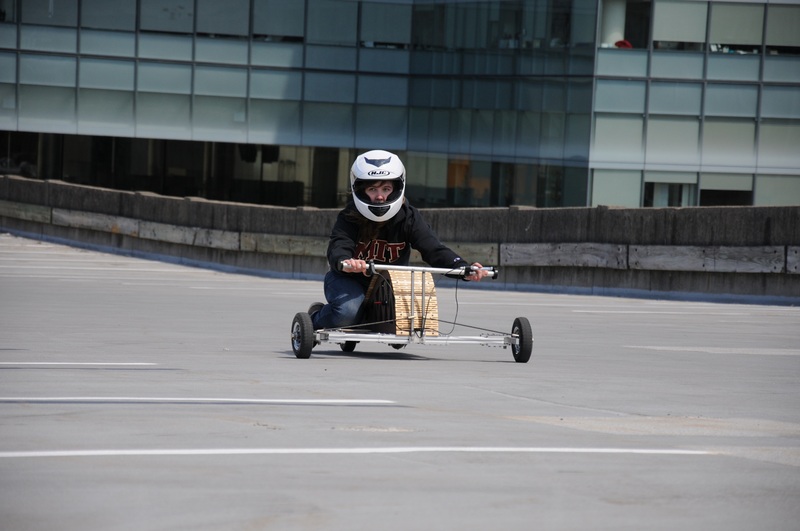 Sixteen undergraduates in Mechanical Engineering, together with some clowns from EECS, built eight kart-like devices over the course of twelve weeks (so that’s 0.04166 kart-undergrads/week?) , and at the end, like last year, there were games. For the full story of this year’s class, see the three previous relevant posts: Intro, progress update 1, and progress update 2. The bottom line is: $500 budget, some free materials, and practically no design constraints. The class goal is to teach you how to shop for parts and use rapid-prototyping resources that we have to build nice, functional things very quickly. So basically, 2.00-my-Instructable. The crowd this year ranged from those who had some experience with the “design” part of EV Design from taking Mechanical Engineering’s introductory freshman course, to those who had experience building larger mechanical systems through FIRST, or who were basically pros already. I was afraid a little of going 2-person teams this year, since inevitably you might come to hate your partner, but the group was small enough, and enough of the class knew each other already, to avoid unwanted team dynamics for the most part. 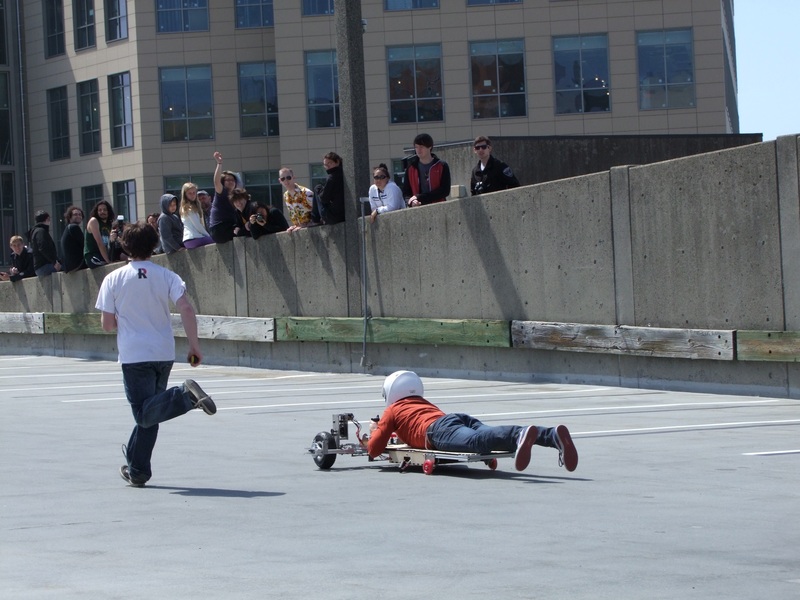 Designwise, it’s particularly worth pointing out that nobody built a “normal” go-kart. By that, I mean 4 wheels, single rear axle, sit-down. There were many “tadpole trike” style designs which tried to save cost and complexity by using one rear wheel, so as to afford a better powertrain. That’s as ‘normal’ as the crowd got, and it only became more exciting from there. “Bobcat” style lever steering was infectious – of the three designs which steered with “rudders” as we called them, nobody used tank steering, but the linkages were hooked up to the front wheels to pivot them. 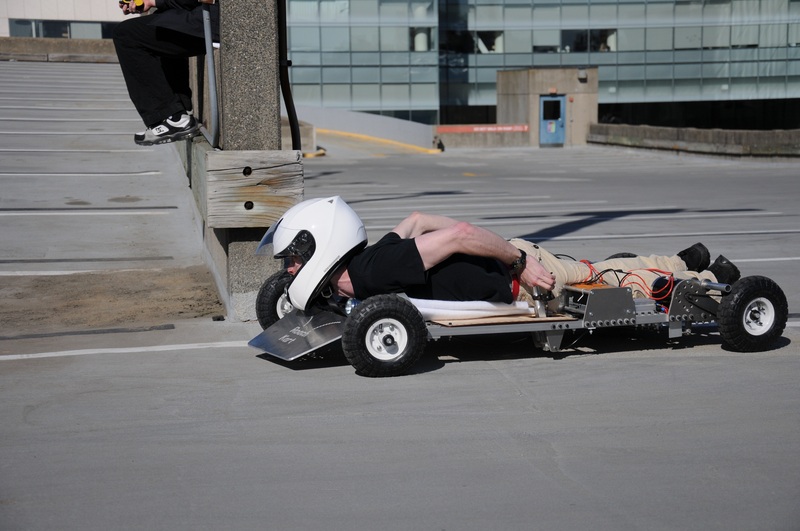 And on top of all that, there were not one but two designs which placed the driver face first, lying down. That’s what I get for setting very few rules about the actual design, I suppose. 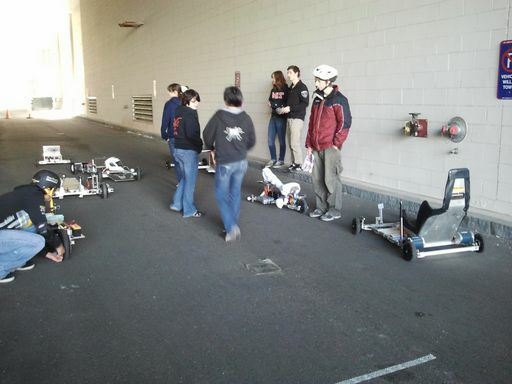 This post is just going to be a competition recap – after the previous update, there was only wiring and drive testing involved, most of which was in the parking lot so was not particularly exciting to watch. Skip to the bottom for the highlights video! 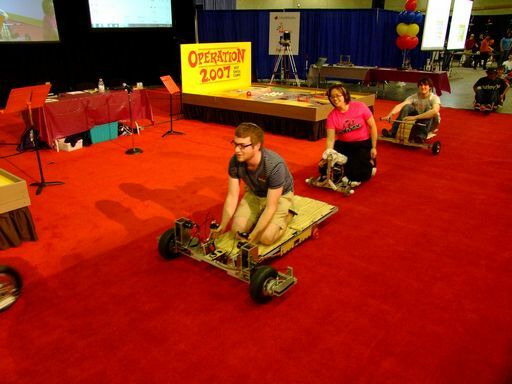 The most pressing task on my end in the last few weeks was preparing the defense strategy for the garage events. Last year, in response to safety office concerns about people nosing head first into concrete walls (a real and legitimate problem this year! ), we set up those big orange fishing nets construction site debris barriers strung up on steel cables. While they could have been okay for scooters and other situations where the rider is roughly net height, the go-karts would all be too low for them to work (in the worst case they’d just strangle you on the way out). The nets were also a pain to set up, and once they were un-deployed, we really had no hope of ever saving them again since the steel cables became tangled up. 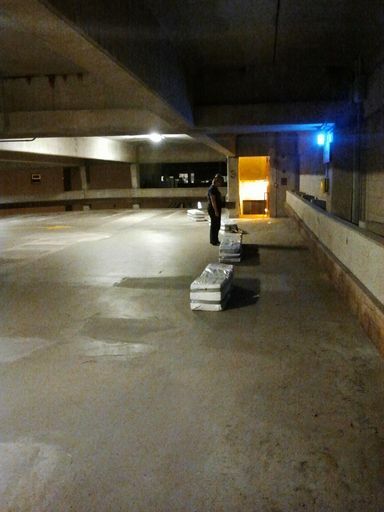 Last year, I bought a few bricks of blow-in natural fiber insulation (made of shredded cloth and paper, more or less) to pad the structural columns of the garage. My goal this year was to convince the safety office that a row of these (soft, fluffy) bricks was all you needed for go-karts. After all, everyone will hit things more or less at the same level this year, and the combined mass of the bricks plus their deformability will do a better job than a slingshot cable-hung net. Fortunately, convincing them was not particularly an issue – I basically got back the professional version of “lol k”. So up they went. Myself and 3 students, the evening before the competition, set up the garage’s narrow wall end with a discontiguous wall of fluffy bricks. Notice that there’s “panel gaps’ on the order of 5+ feet. It would bad if you approached right at it, but on most floors, people came into this turn very wide, so it was highly unlikely for someone to slip through the gap. Plus, you’d have to be completely ballistic and motionless to not at least try to aim for the soft parts. This solution is much more scalable – setup and teardown took around 30 minutes each. Besides the narrow end-turn region, a few of them were scattered around the columns as usual. 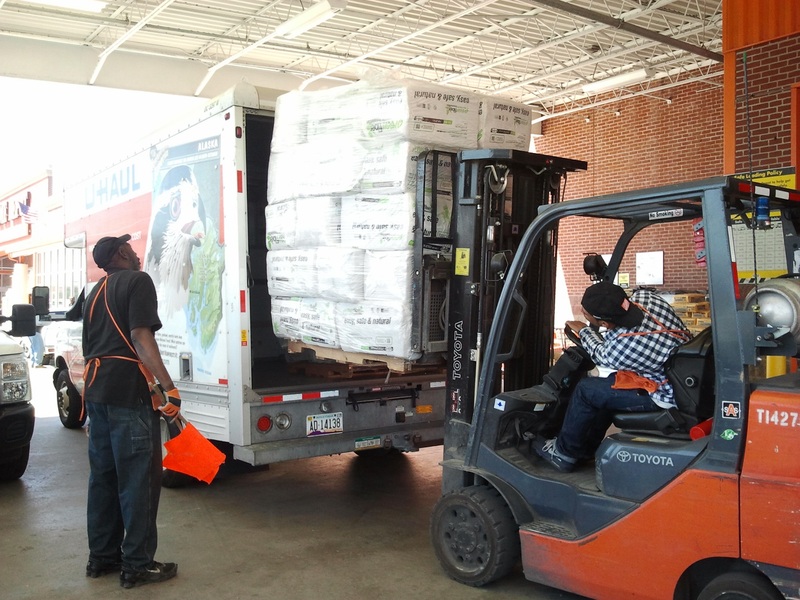 78 little fluff bricks were used in total, and after seeing how little of the average 14 foot box truck they filled, I’m completely fine with filling in the big gaps on the next runaround. 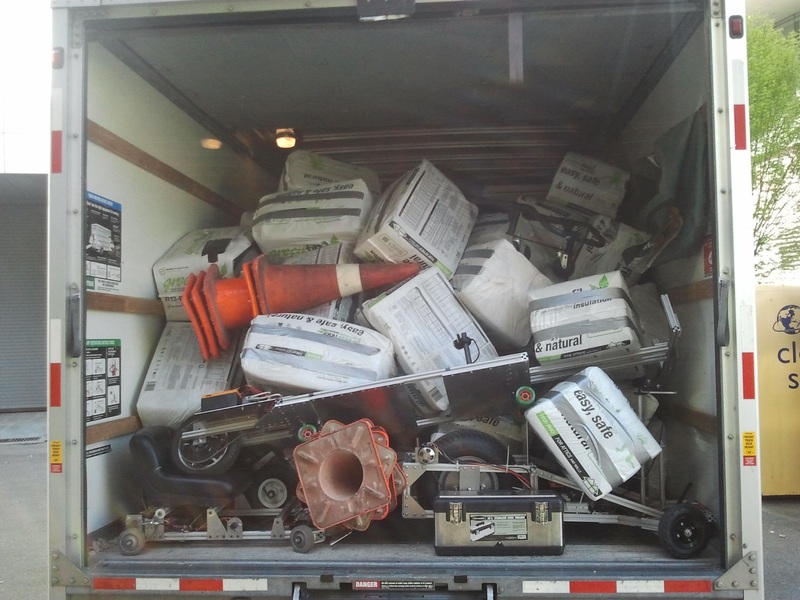 The morning of the competition, the same box truck was used to haul everyone’s karts over to the contest site. Well, those who arrived by 9am anyway. The stragglers were forced to push their karts over. First event of the day was the drag race. As the event organizer, I couldn’t get many pictures of the setup myself, and we were short-staffed enough in the morning that nobody else really got any either. At least there was video. The two top placers in the drag race were a hundredth of a second apart yet represented opposite ends of the traditional EV design spectrum. One was huge, had giant balloon tires, and two massive DC motors. 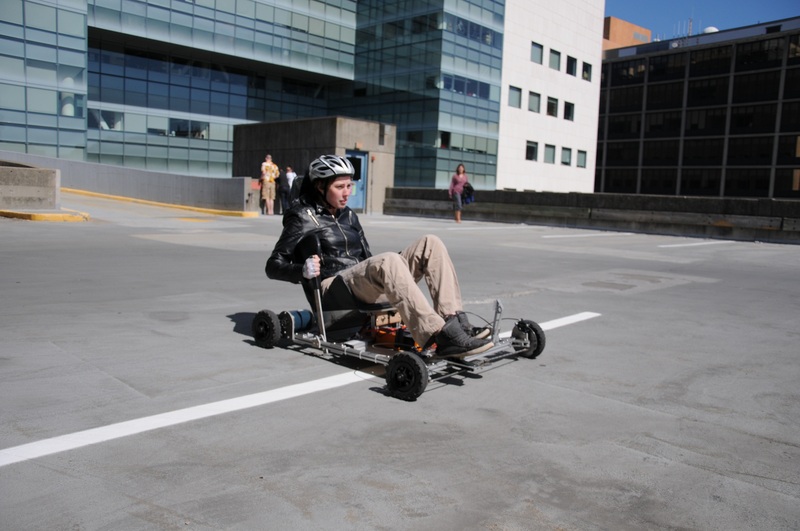 The other was small, lightweight, and had a single brushless motor. After the drag races were done, we broke for lunch and then began the garage hoonage that is now a hallmark of silly vehicle activity at MIT. This is a Dramatic Photograph of the drivers’ meeting, basically me telling everyone where the start and finish are, in a protracted fashion. It’s basically a measure of how efficient you are at doing things. This actually has a mathematical basis in the concept of action. The closer you are to the original (0,0) of the graph, the less energy you used AND the faster you did it. So, there are actually myriad ways to score in something seemingly as simple as driving in a long upward spiral (for the same driver – the score is, of course, affected strongly by mass). You could run wide open all the time and get the best time, but you might use a ton of battery energy in the process – and hence could lose to someone more middle-of-the-road and who took it easy. “Supermankart” (which I whimshically termed “Suicidekart #2″) on the last leg of the climb, with the finish line around the corner. The only thing to resemble a normal 4-wheel kart if it were not for its “reverse lawn tractor” steering patched on during the middle of term, the affectionately named “Beschleunigen Warenkorb” – as far as I understand it means “accelerating shopping basket“. 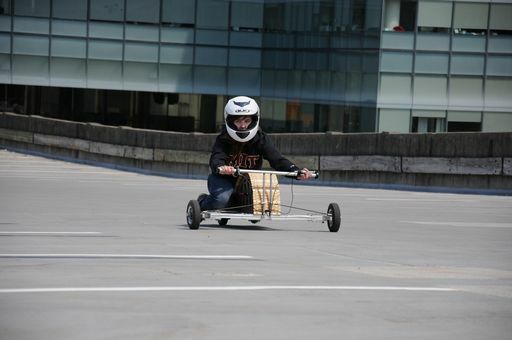 Suicidekart #1 “RoachKart”, so called because it’s extremely flat and quick, and on top of that seems to like going in random unintended directions. “MiloKart”, named after a dorm cat with allegedly a very disproportionate rear end. The wheel is an 18″ lawn tractor wheel. Zoran, the Norse God of Marshmellow Cream Puffs speed, and not to be confused with Zorak. The two builders of this machine blog more often than I do. Bull Kart, nicknamed “lugekart” during the semester, so called because of its two long vertical footrest bars. 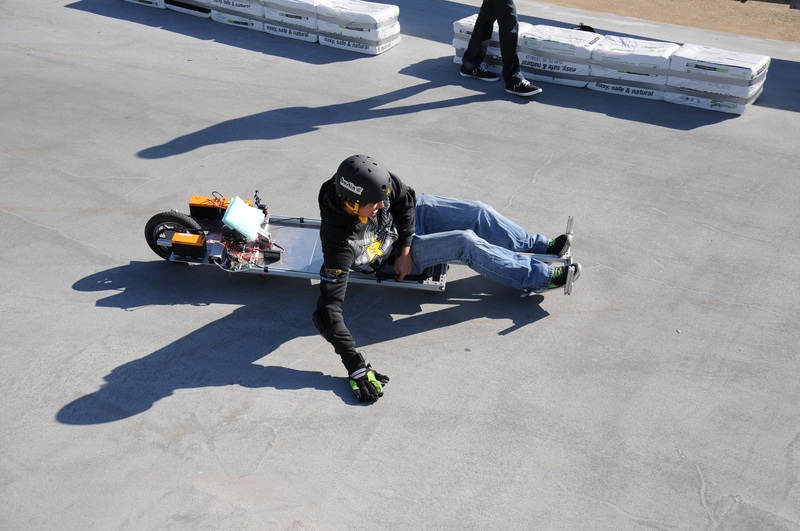 It was basically a motorized street luge built using longboard components. Here, one of the drivers pulls a tighter-than-usual turn. 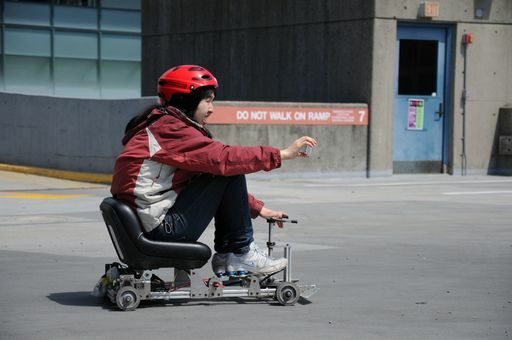 “Derpscooter”, one of the two contenders for first place along with RoachKart. The power system of this contraption was a C-8085-180 “short melon” motor with a 150A Kelly controller. 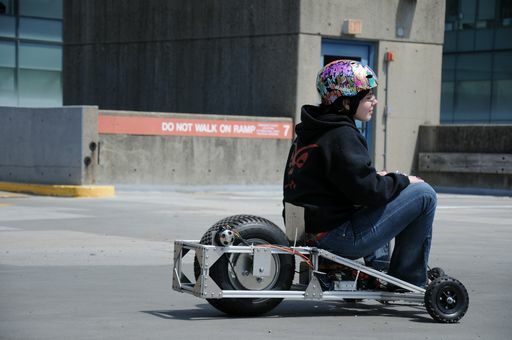 It’s the first usage of a melon-class motor with a controller that can actually feed it well – often, people try to use these large motors with small controllers that inevitably detonate or are severely underpowered. Derpscooter edged out Roachkart in both competitions by single significant figures to take the overall win. Camera car service was provided by shewu operating the DPRC…and an iPhone 5. What’s left to do after the competition is over? Dispense with the clean, orderly arrangement of loading up and just start piling. This beautiful traditional go-kart-and-fluff arrangement was promptly shat out unceremoniously into our shop building’s loading zone. During the intermission between the elimination and playoff rounds, there was a parade in front of everyone. I was presented with this set of “nonfuzzy dice”, laser etched with everyone’s creation logos or CAD images, in walnut wood. My students had all heard of mikuvan by now, so I guess some of them banded up to create something for it. 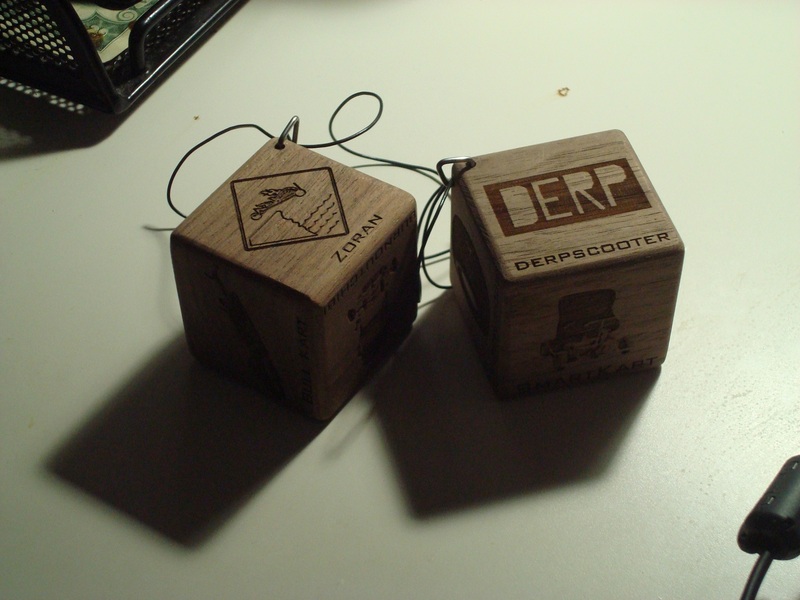 These nonfuzzy dice will be mounted proudly in wherever you’re supposed to hang dice that aren’t fuzzy in a car. And now for the tl;dr: the highlights video from this year! The plan for this crew is *eight* teams of three and two additional teams of two for those who are more skilled. The students are less mechanically inclined than my class this semester, and they will have to learn to deal with our curious units system. So, there will be some changes to the course material. The class is only 8 weeks instead of 13, so I’ll have to plan which “milestones” to condense accordingly. And, more materials will be provided, because the impact of having to wait a whole week for a part will be unacceptably great in this timeframe. People will still have the ability to specify their own parts if they want, but otherwise, I’ll have a giant bin of things to pick from. Stay tuned for the third great race-off at the end of summer. What happens to the EV garden since the builder’s can’t keep them? Theme created by miloIIIIVII | WordPress | Entries (RSS) | Comments (RSS) | 32 queries. 0.225 seconds.